I can say that ShixxNOTE 6.net is working on latest Microsoft operating system Windows 7 (all editions Home Premium, Professional, Ultimate). Soon I will put some screenshots so you will be able to see it. Reason for this is that ShixxNOTE program is written in C++ program language using Visual Studio 6. And because of that it doesn't require any framework or runtime. Program is using all functions from Microsoft original libraries (DLL's) except one "dll" which is used for image handling but this "dll" is also written in C++ program language. So my ShixxNOTE program is ready for all future operating systems released from Microsoft Corporation as the latest one Windows 7 which is really good operating system. But there is one minor "problem". When you start your computer ShixxNOTE is reading your network neighborhood, before on Windows Vista and all old Windows operating systems that last few seconds or maximum few minutes. On Windows 7 you can experience that you see small ShixxNOTE program dialog above the clock in the task bar, which says "Reading your network neighborhood. Wait for few seconds ...", for up to 5 minutes if you have more than 20 computers in your LAN. In a new version which will be soon released I have implemented fast network reading which will solve this little "problem" and program will read your network in a seconds on all old and future Windows operating systems. 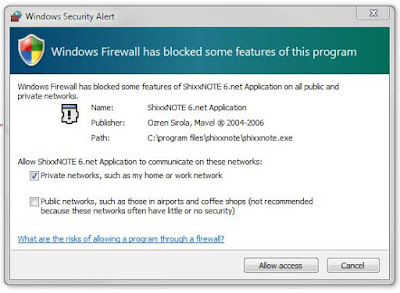 Also if you have problems with sending or reading note(s) then you should manage Windows Firewall and add "ShixxNote.exe" program in exception program list. If you get dialog like picture bellow, click on button "Allow access" and check box like on the picture. This is picture from Windows Security and that could be reason why suddenly you can send or receive note. If you still experience some problems with firewall be sure that port 2000 is open for ShixxNOTE to run normally and that “ShixxNote.exe” file should be in list where are programs that are not blocked by firewall or some other security program. 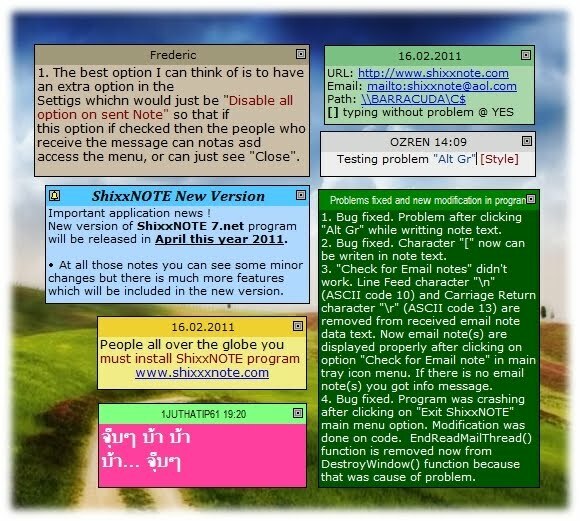 Write me if you have any problem running ShixxNOTE on Windows 7 operating system if you read this article. I will always answer you promptly on any email with some question.